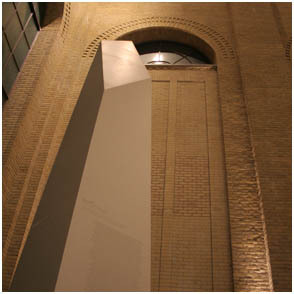 The 20-foot high adapted Obelisk form links the museum's heritage to its dynamic new architecture. YouTube video by a fan. An ancient form updated with the visual language of the ROM's bold new Daniel Libeskind addition, this 20-foot tall interactive obelisk respects the museum’s heritage while recognizing those who contributed to its future. The texture of the carved names invites visitors to touch the surface of the obelisk. As a person’s hand nears the surface, the depths of the nearby names glow with a soft light. The glow smoothly follows the movement of each visitor's fingers, lingering in a graceful trail that gradually fades away. The donors’ experience of lighting up their own names is one of astonishment and delight. The personal response increases donors’ sense of ownership and stewardship for the space and the institution. Design, Software: Gorbet Design, Inc.